A few weeks ago, I did a post on button-front midi dresses, and while I'm still searching for the perfect one, I did manage to find a button-front mini dress after seeing it on another blogger (see, bloggers are just like you—we shop on Instagram too!). I've worn it a bunch of times already in actual summer weather, but this was my first time wearing it in the city which, as I mentioned last week, is not really "summer," hence my jacket. But, I'm still keeping things summer-ish with accessories, and the best part? Nearly everything I'm wearing is under $100! I saw this Topshop dress on Allyson in Wonderland's Instagram and promptly bought it—for $60, it was pretty much instantaneous. The fabric is a very lightweight linen (one caveat: it wrinkles like crazy) and while you can't see the sleeves in this outfit, they're short and very full, which is fun and flattering. The neckline is a bit low, but I found a front-clasp bra works without a problem. My other caveat is that it runs a bit small—I'm in a US 8 here and could probably have gone up to a 10—and a bit short. So something to keep in mind if you're on the taller side. I've had this Rebecca Taylor jacket for ages—I love it because it has the structure of a moto jacket with the softness of a sweater, and it's the perfect weight for San Francisco. It's also great when I need a warmer jacket in the summer; since it's so light in color, it doesn't feel too out-of-season. If you're lucky, you can sometimes find one of these on The Real Real, but I've linked a similar style below. If you follow me on Instagram, you know that I bought this bag on impulse a few weeks ago at Target. It was only $24.99, so how could I not? I was worried that I wouldn't be able to fit anything in it, but it holds a lot more than you'd think—a phone, a wallet, keys, sunglasses, and lipstick! 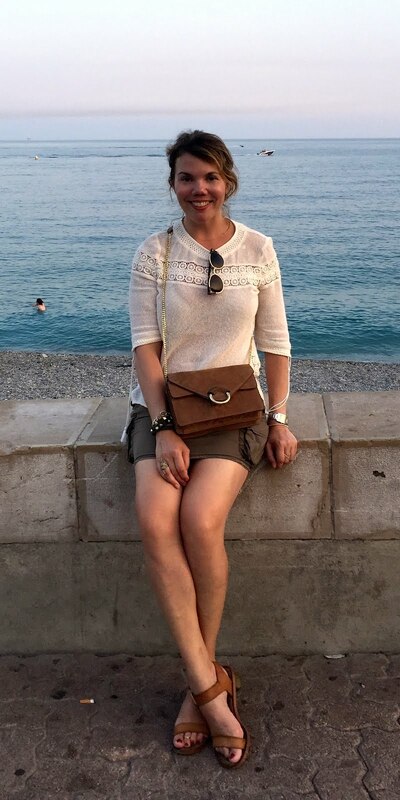 Keeping with the summery theme of my accessories, I chose my favorite Vionic sandals, last seen here. When I wear a dress this short, I almost always wear flats or very low heels; my inner conservative Midwesterner would feel scandalized by anything higher. 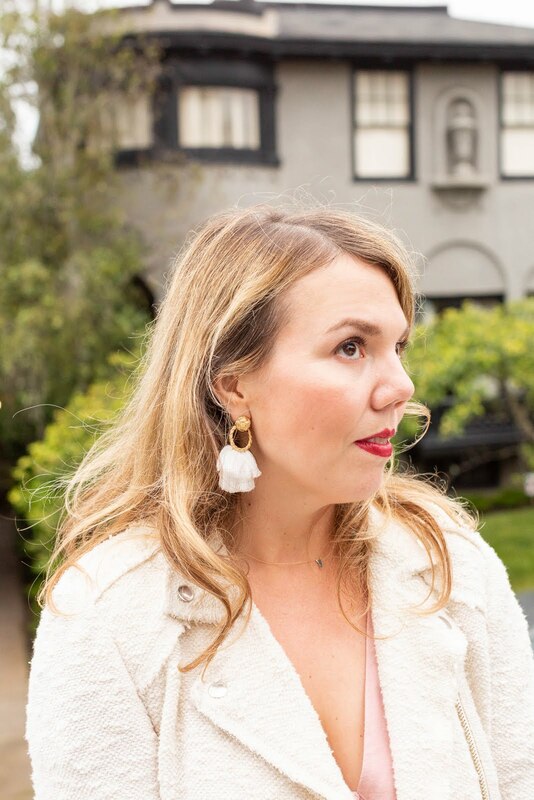 Finally, these fringe earrings were included in my summer Box of Style and I've been wearing them nonstop—they're surprisingly lightweight for statement earrings! We shot these photos in a neighborhood called Sea Cliff—like most of San Francisco, it's pretty ritzy, but unlike Pacific Heights (which is the most well-known ritzy area), this one is kind of quiet and old money. Most of the homes here have Golden Gate Bridge views that are to die for, but you'd kind of never know. If you're in the neighborhood, check out Pizetta 211 for dinner—it's one of San Francisco's best kept secrets! I love that jacket! What a perfect one! The dress is lovely and the color so beautiful! Great look! That dress is fabulous on you! I am loving your new bag too! gorgeous comment! I love how simple, chic and sassy this look. It would be my most go look :) everyday . Love your look, Cheryl. The colours look great together :) Thanks for linking up to The Wednesday Link Up. Such a beautiful look! I love the colors. This button front dress is so cute on you! Also, Instagram tends to be the place that I shop the MOST- haha!! I’d love for you to join our link up today! I love this breezy easy pastel look. That classic blazer polishes it all off, while still casual. Great dress too. I have picked up a couple of button-front dresses too and I love both button-front dresses and skirts this Summer. And they are more versatile than one may think. Welcome join my Tuesdays monthly linkup. It is the last Tuesday of every month, also join my Thursday Moda every week and share your beautiful style, Thanks!! =)) Ada.